DomaCom is working with KSI Investments to bring another Badgerys Creek Land banking Crowdfunding campaign to you. KSI Investments is an investment management company that assists investors to take advantage of real estate opportunities in Australia. With their methodology and networks across Sydney, they can identify and negotiate opportunities before they become available to the wider market, giving investors a significant competitive advantage at the acquisition stage. Once the land is acquired KSI Investments have the skillset to manage the opportunity through subsequent phases of development to extract additional value. Land banking is the process of investing in (identifying and purchasing) undeveloped land with a view to increasing its value over time through holding, rezoning and developing. The concept of land banking via the DomaCom Fund is to provide a vehicle that will enable a number of investors to acquire an area of land zoned for rural or agricultural use that will, due to growth in the urban corridor, eventually be re-zoned to residential. The investment objective is to hold the land for the long term to see the property increase in value as population/housing demand sees re-zoning occur to create new suburbs. The opportunity for investors to obtain exposure to land banking assets was previously the domain of institutional investors. 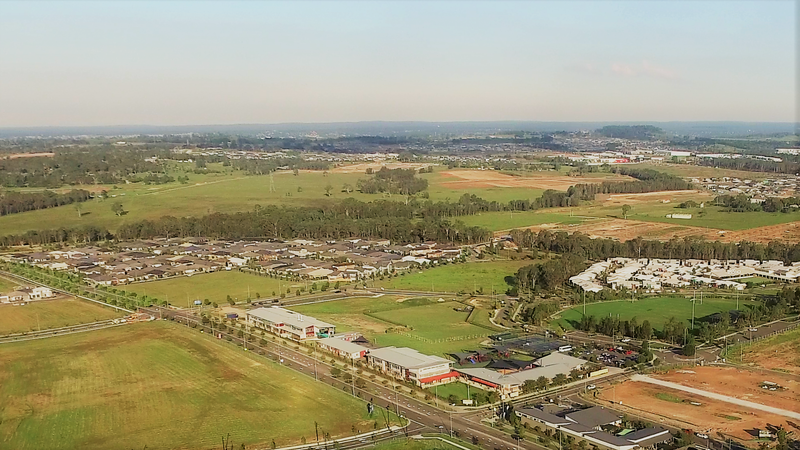 If you would like to invest in Badgerys Creek Land banking site within the DomaCom Fund, you can join this crowdfunding campaign by completing the application and lodging your investment funds through this General Advice page. Please ensure that you first read the DomaCom Fund’s Product Disclosure Statement (PDS). For a copy of the current PDS please click here or call your financial adviser. When you have lodged your bid and the campaign is filled, you will receive a Supplementary Product Disclosure Statement (SPDS) outlining the specific offer to invest in this land banking investment opportunity, which will contain all the information required for you to make a decision. You are not bound to proceed with your bid amount in the sub-fund that will acquire the Badgerys Creek NSW land site until you accept the offer contained in the SPDS (which will include the specific details for the properties). If you are an existing DomaCom Fund investor, you can log in to access your account and all the other public crowdfunding campaigns by clicking the Investor Login button below. • No guarantee – Returns are not guaranteed and Investors may lose some or all of their capital. The nature of this investment is to expect an appreciation in the value of the units, with little to no income to be paid to investors during the term of the investment. There is no guarantee that this expectation will be fulfilled. • Past performance – While this area of Sydney in which the underlying property is based has experienced capital growth in the land value in the past, this is no indication it will increase in value in the future. • Liquidity risk – An Investor cannot withdraw from the Sub-Fund until the Sub-Fund is terminated, and the Underlying Property is sold. DomaCom does intend to offer a facility through which Investors can seek to sell their Units to another party, however, there is no guarantee of this. • Damage or loss – There is a range of events that can damage the Underlying Property including acts of God (fire, flood, earthquake and other natural disasters) through to accidents, negligence, and failures of maintenance. While insurances will be in place it may not cover or may not fully cover such losses. • Insufficient income – The costs associated with Underlying Property may exceed its income, however, if there is a shortfall, Investors will be given an opportunity to subscribe for additional Units in the Sub-Fund to meet those expenses pro rata to their Unit holding in the Sub-Fund. Investors who don’t subscribe for further units will have their investment in the Sub-Fund diluted. • Vacancy risk – a property manager will be appointed to manage the property and secure tenants to tenant the property and derive income from the market garden. If tenants are not secured, there is a risk that the property will not generate the income that has been budgeted for. If this were to occur the investors may be required to raise further funds to offset the expenses of running the property. • Re-zoning risk – The Underlying Property is located within Sydney’s South West Growth Centre, Future Residential Growth Area. This precinct is earmarked for future re-zoning, however, there is no exact date for any proposed re-zoning. 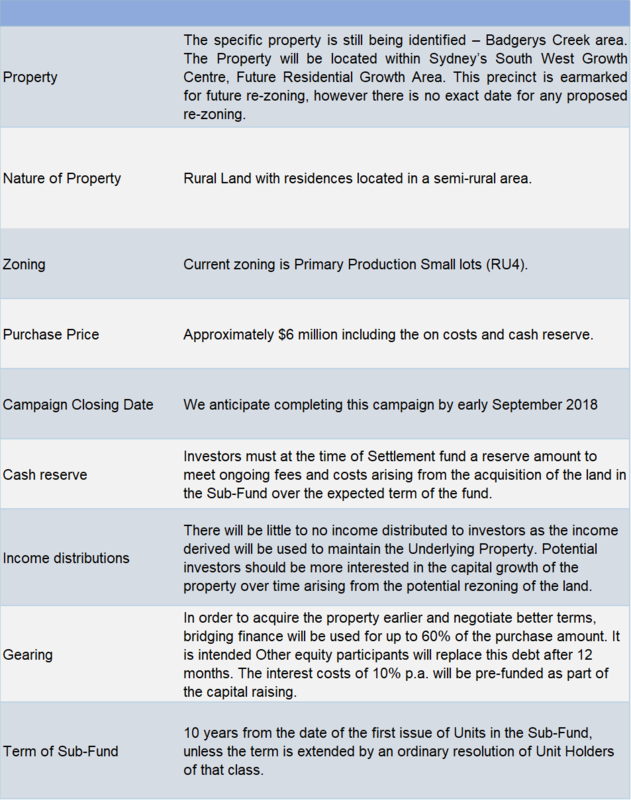 There is a risk that re-zoning may not occur throughout the life of this Sub-Fund. • Unexpected property event – The risk that the Underlying Property may be negatively impacted due to a property-specific event, for example, a change could occur to local zoning rules, development of competing and other events that were not anticipated at the time of acquisition. • Economic risk – There is a risk that the general economic conditions in Australia may change in relation to interest rates, employment rate and economic growth that could, in turn, have an impact on the Property market and specifically the value of the Underlying Property. • The estimated total ongoing operating costs for the Sub-fund that will hold the property is 2% p.a. This is primarily represented by the DomaCom Management Fee of 0.88% p.a. and KSI Project Management Fee of 1.12% p.a. • Performance Fee – If the campaign is successful and the Land is acquired, it is anticipated that the Land will be held for a period of 10 years. Upon the eventual sale of the land by the Sub-Fund there will be a performance fee of 20% paid to KSI Investments on the difference between the purchase price and the sales price. The remaining 80% of this profit will be paid to all investors in proportion to their investment. Set out in the table below is an illustration of the campaign costs that are likely to be incurred. An Investor who participates in a Campaign and has had an Active Bid which fails to result in the formation of a Sub-Fund will be liable (in a proportion that is equal to the amount of their bid divided by the sum of all Active Bids at the time the Campaign costs were incurred) for the Campaign costs incurred by DomaCom. The investors will be only liable for Campaign costs and Acquisition costs that are set out below if the Sub-Fund was not created, as these costs have been incurred prior to the acquisition of the property. If the Sub-Fund is established, these costs will be deducted from the Sub-Fund and only those investors that accept the SPDS will incur the onboarding costs – Campaign, Acquisition and Settlement costs. Based on information carried out by KSI Investments Analysed data of properties traded in the suburbs of South West Growth Centre (SWGC) & North West Growth Centre (NWGC) across 14 suburbs, Transactions between 1985 – 2018, Size: 9,999m2 – 29,999m2 and Data sourced from RP Data core Logic. 13%: Land prices grow with the average rate noted between 1985 – 2005 in the NWGC and SWGC when land was still zoned rural. The price growth in this period was the natural increase in land values as rezoning to residential only impacted prices from 2006. 23%: Prices continue to grow with the average rate of 2012 – 2017 noted in the NWGC to account for the impact of the rezoning to the residential and general development of the area. Given the similarities between the NWGC and the SWGC both being priority growth areas of Greater Sydney, it is reasonable to use historical data from the NWGC as a benchmark for forecasting prices in the SWGC. It should be noted that while historical performance provides a guide it does not necessarily mean that future performance will be the same as it has been historically. #Based on research carried out by KSI Investments Analysed data of properties traded in the suburbs of South West Growth Centre (SWGC) & North West Growth Centre (NWGC) across 14 suburbs, Transactions between 1985 – 2018, Size: 9,999m2 – 29,999m2 and Data sourced from RP Data core Logic.